In 1917, the Hellfighters were formed from a New York National Guard unit to serve in Europe for the U.S. during World War I. Because of segregationist policies in the U.S. armed forces at the time, the nearly all African American unit was seconded to the French Army when they arrived in Europe. The French welcomed the new soldiers as there was no segregation in the French forces and they needed more manpower to bolster their nearly exhausted armies that had been fighting since 1914 (this is why many depictions of the Hellfighters show them wearing French-style “Adrian” helmets). From May to November of 1918, the Hellfighters served in combined Allied offensives where they served in the Second Battle of the Marne and Bellau Woods, gaining a reputation for rapidly decimating Central Powers forces in battle. They reached the Rhine River on Armistice Day, November 11, 1918. In honor of their bravery, many officers and men earned several important decorations, including Medals of Honor and Distinguished Service Crosses from the U.S., and several French Croix de Guerre medals. Among some of the other superlatives, the Hellfighters were one of the few units for the Allies in World War I that never lost ground taken or had a soldier captured by the enemy. The unit was welcomed home as heroes, marching in a parade being cheered by New Yorkers of all races. 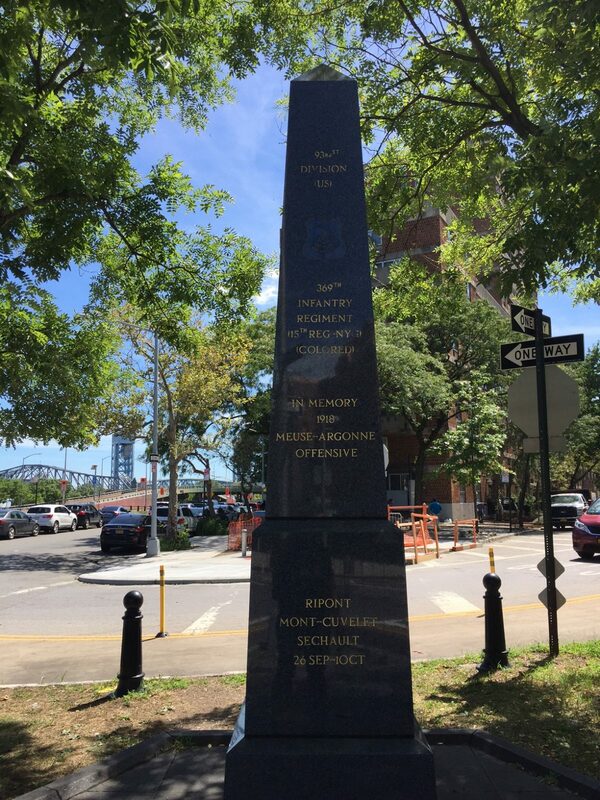 For their heroism, the Hellfighters have a monument in the Upper Manhattan neighborhood as a testament to their bravery in battle and willingness to defend our country. The unit has been the subject of renewed interest in recent years—including its portrayal in a popular graphic novel and the renaming of Harlem River Drive in honor of the Hellfighters. This is the type of information you will learn on a Sights by Sam tour.